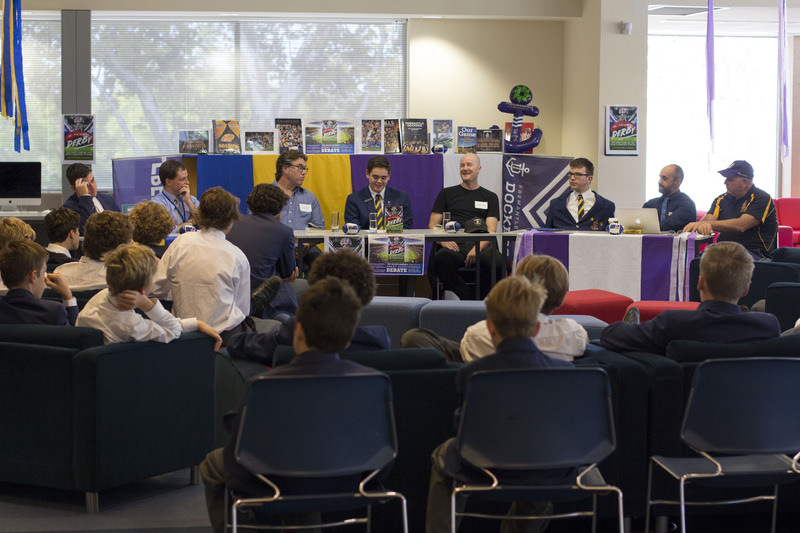 All boys were invited to the Senior Library this week to meet visiting authors David Wish-Wilson and Sean Gorman, and to bear witness to the Senior Library’s ‘Great Derby Debate’. 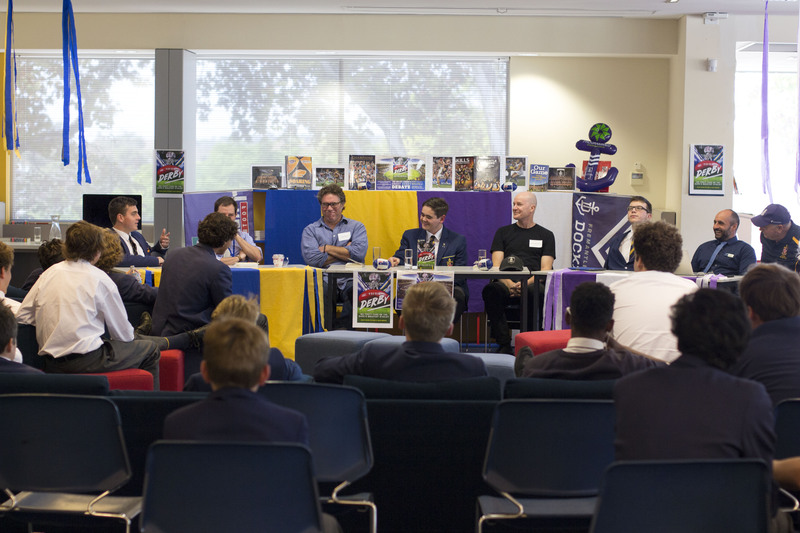 This involved a panel style debate aimed at determining once and for all which AFL team of the West is really best – West Coast Eagles or Fremantle Dockers? 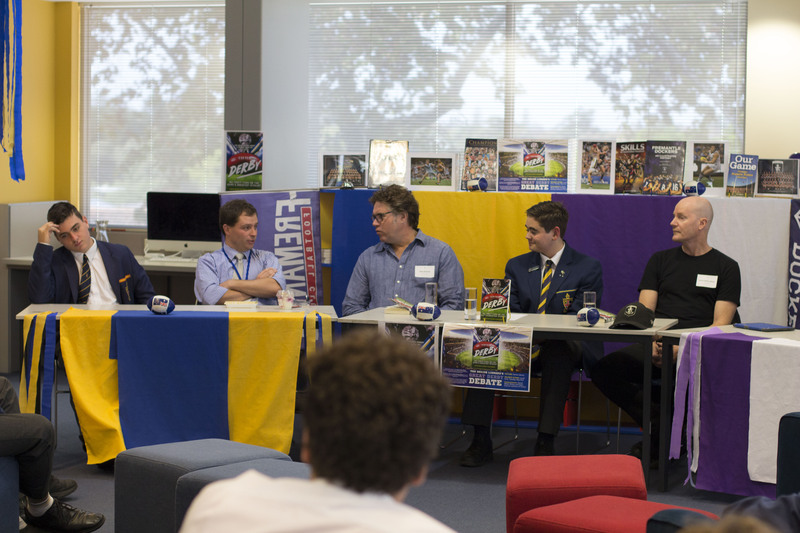 Kicking off the debate, Josh Coales (Year 10 student and expert Dockers supporter) as debate host introduced the guest authors who were invited to discuss their latest book Derby: WA Footy Fans on the Game’s Greatest Rivalry. 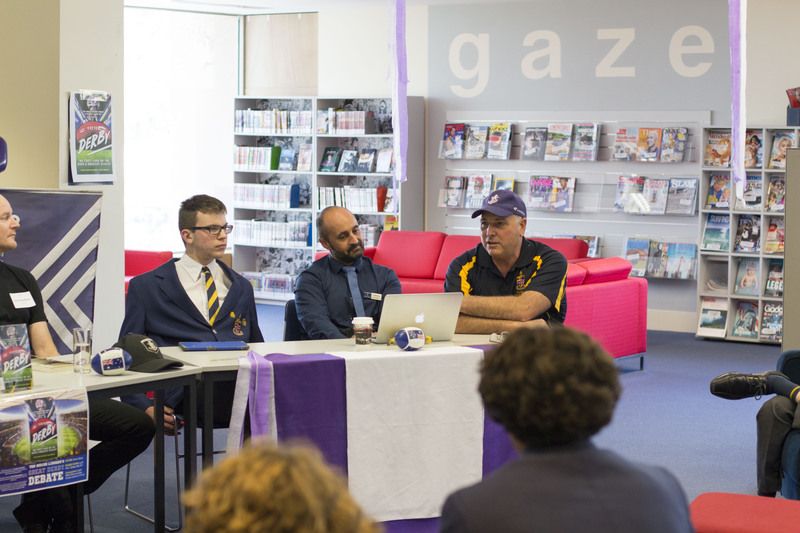 Reading aloud, David and Sean shared their favourite derby anecdotes and helped set the scene for the rest of the debate. 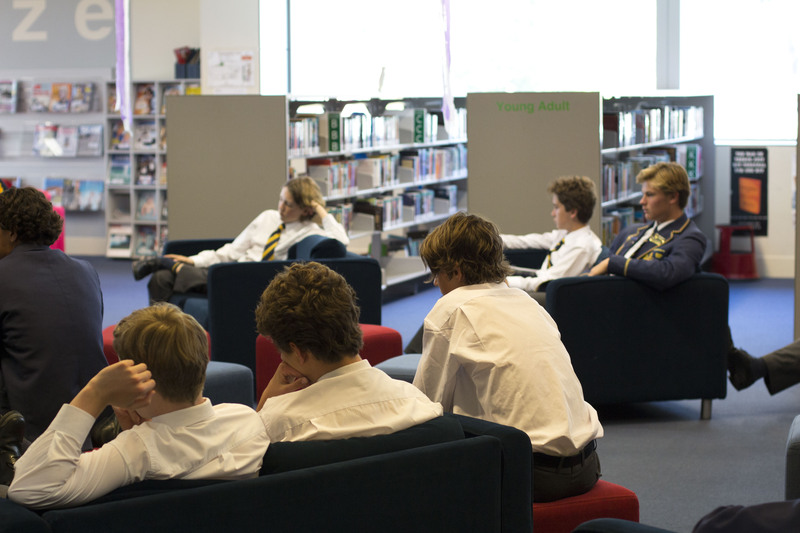 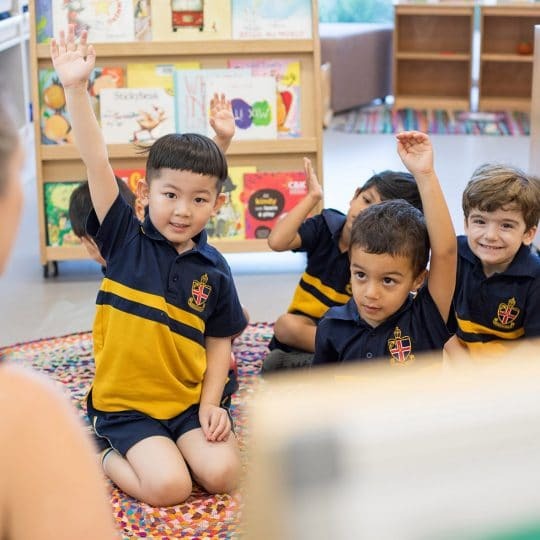 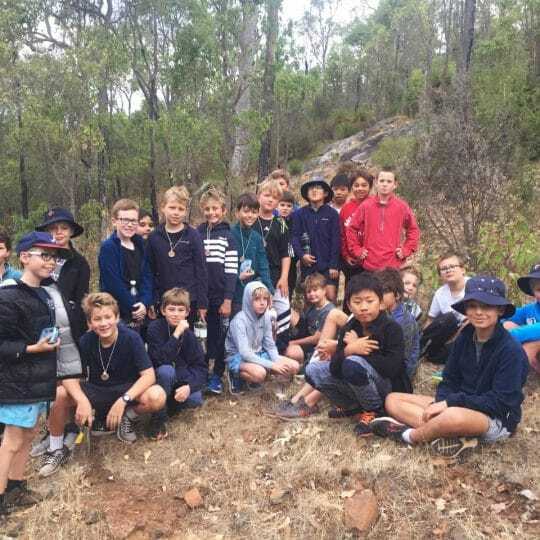 “It was a great opportunity to promote reading to the boys through the excitement of the derby and the release of this fantastic book”, says Teacher Librarian, Tamara Bowen. 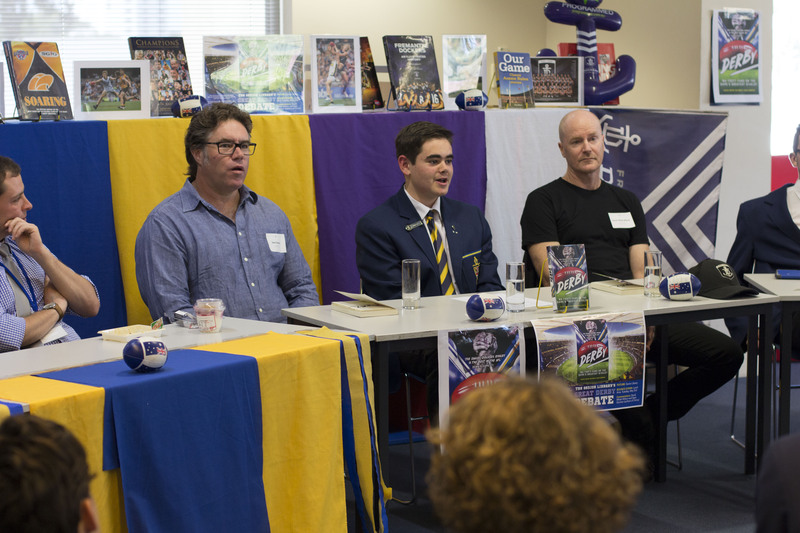 The School’s most passionate football fans formed a formidable panel during the session. 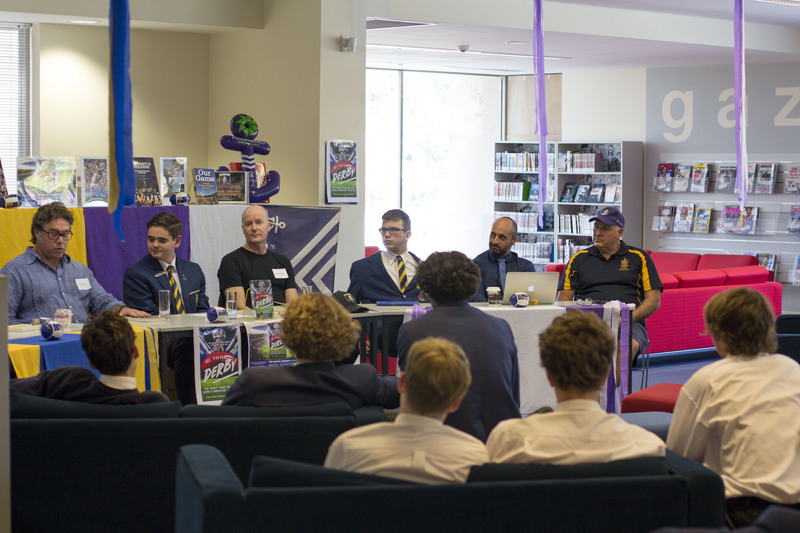 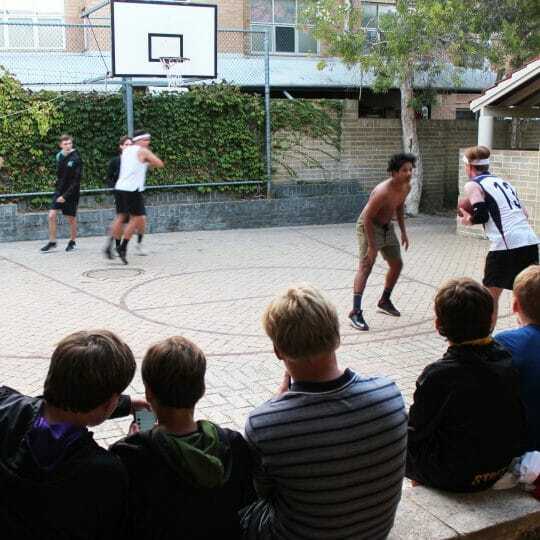 Dockers fans, Mr Raffaele Guadagnino (School Psychologist and Teacher- in-Charge of Football), Mr Frank Pasquale (Maintenance) and Andrew Mathewson (Year 11) took on die-hard Eagles fans, Mr Sam Wallace (Humanities Teacher and Firsts Football Coach) and Edward Galluccio (Year 12 student) to battle it out over topics such as best derby moments, best WA players of all time, and what we can expect from both teams this season. 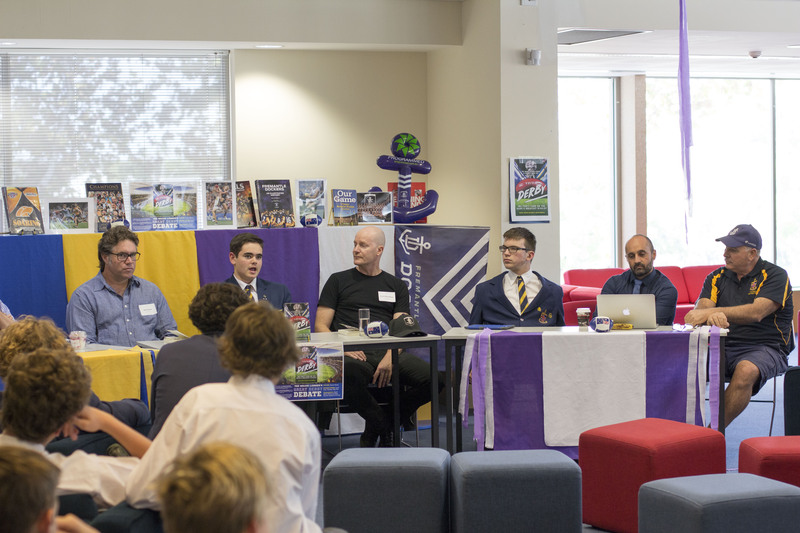 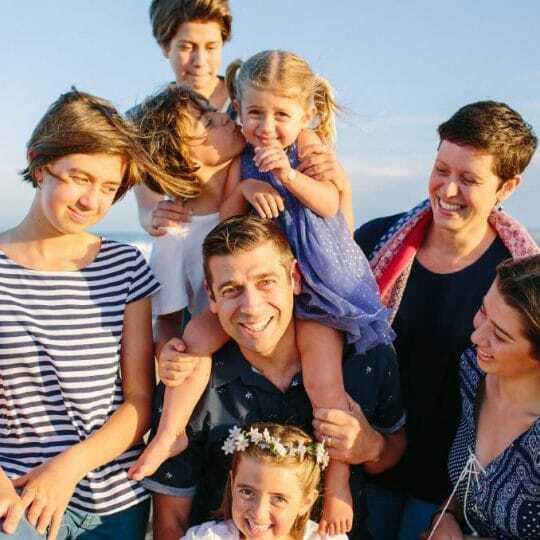 Throughout the debate both sides maintained diplomacy and decorum despite Mr Pasquale’s and Mr Guadagnino’s best efforts to rile their opposition. 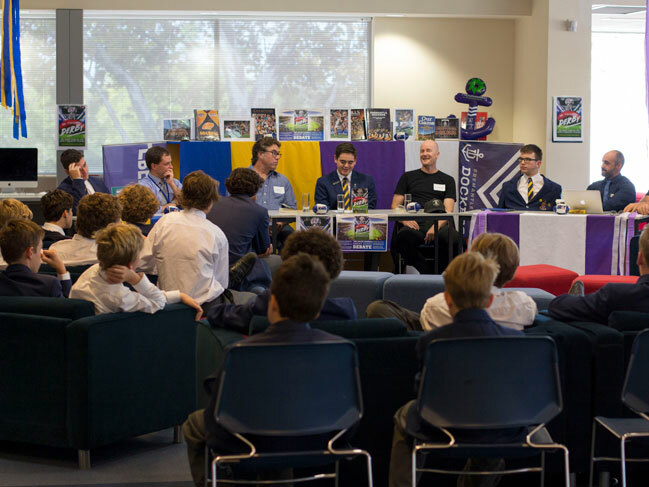 The end of lunch period signalled an end to the debate just as discussions were heating up. 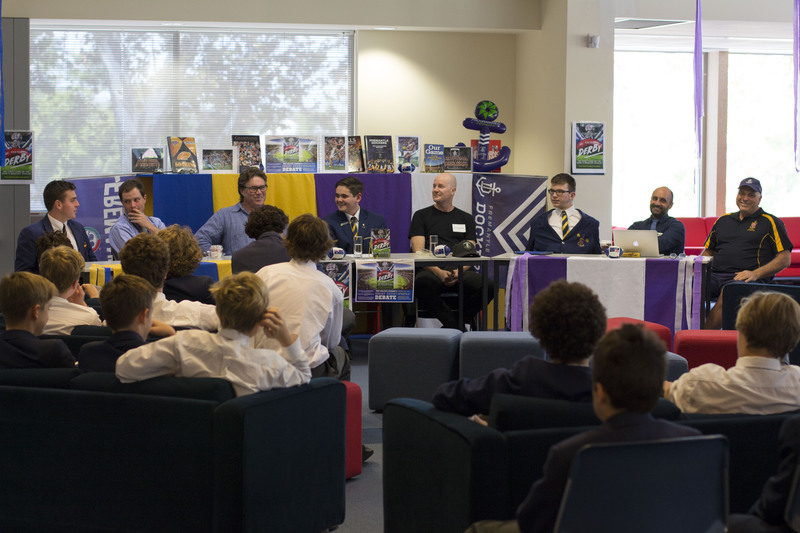 With students on both sides demonstrating extraordinary AFL knowledge (and a retort for every rebuke) there was no clear winner and the debate was officially called a draw. 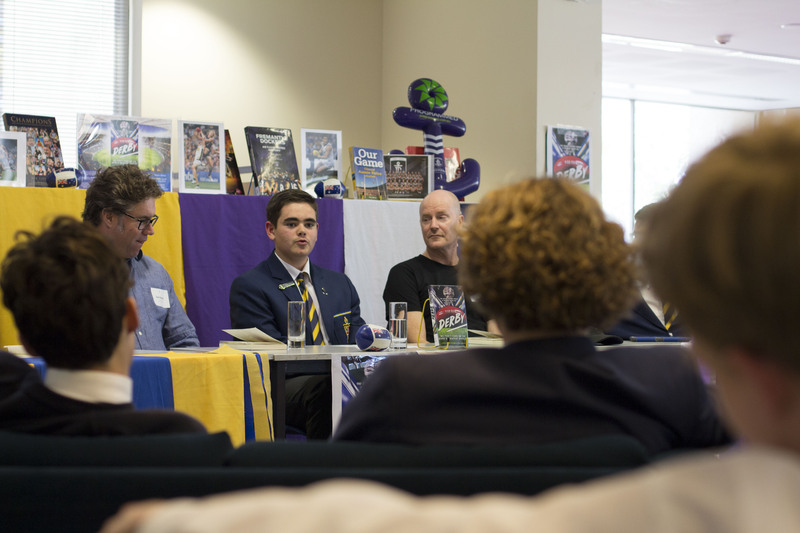 Derby: WA Footy Fans on the Game’s Greatest Rivalry is now available to borrow or purchase in the Senior Library.